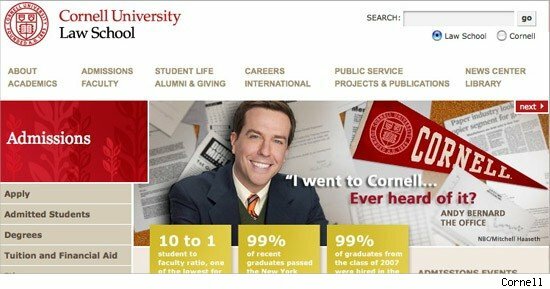 "The Office's" Andy Bernard is being used to promote Cornell University Law School. Only problem: He never went there! Ed Helms' a cappella loving character currently appears on the law school's webpage -- but, as AboveTheLaw.com points out, Andy only went to Cornell for undergrad on the show. FYI -- Andy once said "I graduated in four years, never studied once; I was drunk the whole time" of Cornell on the show.